President Donald Trump met with leaders from historically black colleges and universities in the Oval Office, Feb. 27, 2017. 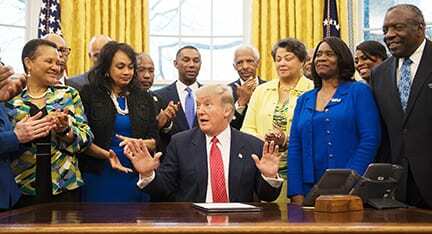 WASHINGTON, DC — The White House announced recently it’s switching up the format of an upcoming meeting between President Donald Trump and representatives of historically black colleges. The move comes as his administration continues to face deep criticism over its polarizing views on race relations in the U.S. While the White House statement did not detail what modifications were being made, it did hint that the administration was looking to downsize Trump’s meeting with the Historically Black Colleges and Universities (HCBUs). Trump found early success in reaching out to these schools, which were at times critical of his predecessor, but the Republican leader’s attacks on their funding, controversial comments following last month’s deadly white nationalist attack in Charlottesville, Virginia and his poor approval rating among black communities in general have strained this relations “Responding to suggestions and feedback from many key stakeholders, the White House initiative on Historically Black Colleges and Universities (HBCUs) will modify its planned conference to best meet the current needs of HBCUs, their students and the broader HBCU community, “ the administration said. “This more intimate HBCU week will feature a series of strategic meetings for students and leaders to share their perspectives on the opportunities and challenges facing the HBCU community. The events will also focus on how the Administration can best work and support HBCU schools and students,” it added. Just over a month after coming to office earlier this year, Trump signed an executive order designed to boost federal funds for HCBUs. The move was seen as an opportunity for the Trump administration to win support of an influential black organization that often criticized his predecessor, President Barack Obama, for not sufficiently addressing the community’s needs, despite him being the first black U.S. president. Trump’s support, however, was short-lived. The administration did not increase funds and actually cut Pel grant reserves and other crucial investment HBCUs had asked for, according to The Washington Post. In May, Trump signed a federal budget that controversially included language at the end suggesting he questioned the constitutionality of funding black colleges in the first place.